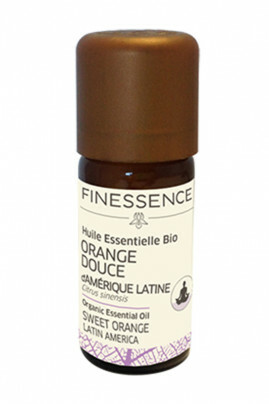 Finessence Organic Sweet Orange Oil from Latin America brings you pep's and positivity in everyday life. Relaxing and comforting, it helps relieve tension and provide real well-being. It is recommended in cases of anxiety and agitation. Its sweet and fruity scent soothes you and offers you a moment of immediate relaxation. It is also perfect to help you fall asleep and fight against sleep disorders. In cosmetic care, it helps soothe problem skin and dermatitis. Take care of yourself and enjoy a moment of sweetness with this Organic Sweet Orange Essential Oil ! Atmospheric diffusion : Create a fruity atmosphere by adding a few drops of essential oil in your diffuser. For broadcast time and dosage, follow the instructions for your device. Cutaneous application : Pour 4 drops of essential oil for 1 teaspoon of vegetable oil of your choice and massage delicately on the zone concerned. The massage is preferred on the solar plexus, the stomach, the lower abdomen or the lumbar according to the problems. Infusion : Mix 3 to 4 drops in one liter of warm water. It is important to dilute the organic essential oil in honey or on a piece of sugar that you will then add in warm water, to unify the mixture. Sweet Orange Oil from Latin America is 100% Organic ! Citrus sinensis peel oil expressed, linalool*, limonene*, citral*, farnesol*, geraniol*, citronellol*, coumarin*. Cause skin irritation and may cause an allergic skin reaction.